D.A. Horton and his family relocated to California to plant Reach Fellowship in south Los Angeles County. They were commissioned by the Summit Network after he completed his residency at Summit Church (Durham, NC). He currently serves as the Chief Evangelist with the Urban Youth Workers Institute (UYWI). 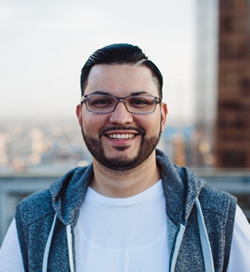 Prior to this he has served as an urban church planter/pastor in Kansas City, MO for nearly 6 years, a National Coordinator of Urban Student Ministries, the Urban Initiatives Team at the North American Mission Board (NAMB) and the Executive Director at ReachLife Ministries, the non-profit arm of Reach Records. He earned his B.S. in Biblical Studies from Calvary Bible College, his Masters Degree in Christian Studies from Calvary Theological Seminary and is currently working on his Ph.D. in Applied Theology at Southeastern Baptist Theological Seminary. With a heart to provide local churches with quality Bible-centered tools and resources for evangelism and discipleship, D.A. wrote two books; G.O.S.P.E.L. and DNA: Foundations of the Faith both published through Moody Publishers. His third book, Bound to Be Free: Escaping Performance to be Captured by Grace, was released through NavPress in spring 2016. He and his wife of 13 years Elicia have two daughters, Izabelle and Lola and one son, D.A. Jr. (aka Duce). D.A. and Elicia are co-authoring a book on marriage set to be released in 2017.